Glaucoma is a process whereby the optic nerve is destroyed due to the pressure of the fluid inside the eye (called the intra-ocular pressure orIOP) being too high for that particular eye. 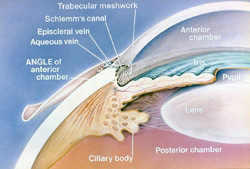 Let’s describe the normal workings inside the eye so that we can understand what goes wrong in glaucoma. There is a fluid produced inside the eye (called the aqueous) that is produced behind the colored part of the eye (the iris). This fluid flows through the pupil (which is just a hole in the iris. This hole allows light to get to the retina so that we can see) and drains out of the eye in the angle between the outside edge of the iris and the base of the cornea, right where the iris meets the white part of the eye, the sclera. This angle is known as the drainage angle. 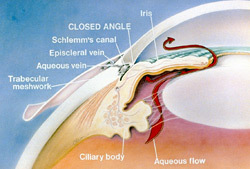 This angle contains the drainage meshwork which is responsible fordraining the aqueous out of the eye. An abnormal protein in this meshwork is responsible for the decreased draining ability of the eye and the subsequent higher intraocular pressure inside the eye. This higher IOP pushes on and slowly kills the optic nerve. This process of killing the optic nerve is called glaucoma. We will only discuss adult onset glaucoma and leave congenital glaucoma for pediatric ophthalmologists to discuss. The risk factors and the two types of adult glaucoma, open angle and closed angle, are described below. Corrected pressure inside the eye of 21 or higher. Race. 1 in 10 African Americans above age 80 have glaucoma as compared to 1 in 50 Caucasian Americans. This has led to the idea that being African American is a major risk factor. Recent evidence, however, points towards thinner corneas in African Americans as being one possible explanation for this higher rate. There are a number of other minor risk factors mentioned in other studies, but none that have been shown to be consistently significant.The more risk factors you have, the higher your risk for developing glaucoma. What are the two main types of Glaucoma in adults? a big contact lens called a Gonioscopy lens. If the drainage angle is not obstructed by the iris, this is called an open angle. 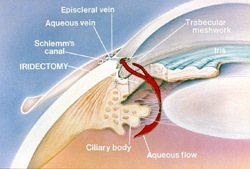 (Despite being called “open”, the aqueous cannot exit the eye through the drainage meshwork due to an abnormal protein in the meshwork. We are working to identify this protein). Open angle glaucoma is by far the most common type of glaucoma in the U.S.A.. If there is an identifiable cause of open angle glaucoma, this is called secondary open angle glaucoma or SOAG. If there is no identifiable cause, this is called primary open angle glaucoma or POAG. In medicine, primary means no identifiable cause for a disease. I’d like to discuss one SOAG in particular at the end of this section, Pigmentary Dispersion Syndrome (PDS). Closed angle: If the iris by the pupil (by the center of the iris) touches the lens too much, the fluid is prevented from traveling through the pupil. Pressure from the flow of the aqueous trying to get through the pupil pushes the iris by the trabecular meshwork forward (called iris bombe).Iris bombe can sometimes cause the iris to bow forward too much, resulting in a complete blockage of the drainage meshwork. Complete blockage results in angle closure glaucoma and this can raise the IOP to 50 mm or even higher. Pressures this high can cause blindness in less than a week and constitute a medical emergency. The treatment and cure for this is placing a hole in the iris with a laser (called a laser peripheral iridectomy or LPI, done easily today with in-office lasers, which allows the aqueous to vent through the iris, avoiding the blockage of the iris at the pupil/lens area. Once the hole is formed, the iris falls towards the lens and away from the drainage angle. This opens the drainage angle up and allows the aqueous to drain normally again. An LPI is actually a permanent cure for angle closure glaucoma. Cures in medicine are not that common so this is a really great procedure to have in our arsenal! We screen patients for narrow angles during a routine eye exam with the slit lamp. Optometrists refer patients to an ophthalmologist if the angles look narrow. If an angle is too narrow and in danger of closure, we perform an LPI prophylactically, before a closed angle attack occurs. Some people do not know that they have narrow angles and present to the ER in full blown angle closure glaucoma. People who are far-sighted, of asian descent and/or over 50 years of age are at higher risk of developing angle closure glaucoma and should have gonioscopy done by an ophthalmologist to make sure that they don’t have narrow angles. For some reasons, most angle closure attacks occur when someone is walking from a dark room towards light (and seems to happen at 9:00 PM on the weekend when an ophthalmologist is not readily available). Some over-the-counter medications will state that if you have glaucoma or are a glaucoma suspect, don’t take the product without checking with your ophthalmologist. What those medications might do is to dilate the iris and in those patients that have iris bombe, precipitate an angle closure attack. This is rare and if your ophthalmologist determines that your angles are open on gonioscopy, there is no need to fear medications that have this statement. Medical steroids (catabolic steroids, not sports or anabolic steroids) can cause very high pressures with open angles but this is a well-known side effect of these medications (prednisone is an example) and you should be screened for this by your ophthalmologist within 7 days of starting these steroids. So, now that we have covered the two types of glaucoma, open and closed, let’s talk about how we detect glaucoma. How do we detect glaucoma? Risk factors for glaucoma or findings on the eye exam can raise the question of glaucoma during a routine eye exam. Most referrals to ophthalmologists for suspicion of glaucoma are due to a high IOP reading on the air puff test or an enlarged cup to disk ratio seen by an optometrist during a routine eye exam. If you have a corrected IOP (corrected by your corneal thickness, which is explained below under tonometry) of 30 or higher, you probably have glaucoma. If you do not have glaucoma outright, you are called a glaucoma suspect. You may be a suspect for many years, but being a glaucoma suspect is better than having glaucoma. Ophthalmologists and Optometrists look at the following items in order to classify a patient as having glaucoma or as being a glaucoma suspect. Tonometry: This is a fancy term describing the measurement of the intra-ocular pressure (IOP). Most Optometrists use the air puff method, which is not as accurate as the blue light method that most ophthalmologists use. Of all of the risk factors mentioned above, the only one that we can alter and therefore treat glaucoma with is through lowering the IOP. Lately, a very important study (the ocular hypertensive treatment Study or OHTS) conclusively showed that a thicker or thinner cornea will throw off our tonometers calibration and hence our reading of the true IOP. Thicker corneas give a falsely high number (someone may measure 24 on the test but really have an IOP of 18) and thinner corneas give a falsely low IOP measurement (someone may measure 19 on the test but really have an IOP of 26). Apachymeter measures the thickness of the cornea. The IOP result after taking the corneal thickness into account is called the “corrected IOP”. Ophthalmologists are still grappling with integrating the OHTS into everyday practice. Full integration will require challenging long-held beliefs by many academic ophthalmologists that need to be modified in light of this new study. I believe that you do not know what the true IOP is until you have performed pachymetry. Cup to Disk ratio (C/D): The optic nerve cup is a depression in the surface of the optic nerve. Optic nerve fibers go around the cup on their way to the brain through the optic nerve. A large cup is potential sign that there are fewer nerve fibers in the optic nerve. (The picture on the left above shows a normal sized cup and a large cup on the right. Notice the enlarged whitish area of the large cup). Most people are born with small to medium sized cups but some patients are born with a large cup, so having a large cup does not necessarily mean that you have glaucoma. However, a large cup by itself may be a small risk factor for developing glaucoma. An extremely large cup usually does signify glaucoma, however. The cup to disk ratio (C/D) is another way of describing the size of the cup. This is the ratio that describes the size of the cup to the size of the whole optic disk. The cup cannot be bigger than the disk. Over time, glaucoma destroys nerve fibers and this causes the C/D ratio to enlarge. Therefore, a large cupmay be a sign of glaucoma. When a patient has glaucoma, this destruction can get severe enough that some areas of the retina no longer send light impulses to the brain and that area of the retina goes blind. Think of a large cable with many small wires in it. If you snip enough of the small wires, you will eventually loose most if not all of the transmission capability along that cable. The eye works in the same manner. (The picture above shows an enlarged cup seen as the whitish area in the middle of the white arrows in the nerve). When we see a patient with a large cup, we need to differentiate a normal large cup from an early glaucomatous cup. We do this is by following the patient over time, looking for the cup to enlarge or stay the same size. Changes in the cup can take months or years to become noticeable. If the cup stays the same size, then you probably don’t have glaucoma. If the cup enlarges, then you probably do have glaucoma. I believe that taking digital photos of your optic nerve every year is the best way to detect changes in the C/D ratio. I do this on all of my glaucoma and glaucoma suspect patients. Gonioscopy: This has to be done in order to determine whether the angles are open (no iris tissue up against the drainage angle) or closed and you are in danger of developing angle closure glaucoma. Gonioscopy is recommended once every 5 years. Visual Field: This has been our gold standard for detecting glaucoma for 100 years. When glaucoma starts to damage the optic nerve, it will not affect your straight-ahead vision nor your side vision way out to the side. It will initially decrease your peripheral vision just above and below your straight ahead gaze. Imagine that you are looking at the center of a door. Initially, glaucoma will decrease your ability to see the top and bottom of the door as you look at the center of the door. At first, the decrease will be very subtle and you will not notice it. 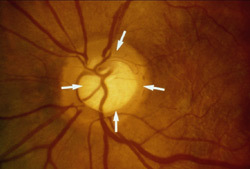 As glaucoma progresses, the peripheral field loss can become very noticeable. In the visual field machine, we cover one eye and line up the other eye for testing. What is important is that you keep looking straight ahead at the fixation light the whole time so that we can test your peripheral vision. The first thing that the machine finds is your natural blind spot. We all naturally have a small blind spot in each eye that is formed from a lack of retinal tissue over the optic nerve. (The retina converts light into electrical impulses that go to the brain so that we can see. No retina, no vision). The machine uses the blind spot to detect when you are not looking straight ahead during the test. Increased fixation losses reduce the reliability of the test. There can be some time between when lights are presented to you during the test and this makes some patients nervous. They think that they should be seeing lights all of the time so they start looking around for them. The machine detects this as a fixation loss and this reduces the reliability of the test. Don’t worry if you don’t see a light for awhile, you aren’t supposed to see 40% of the lights anyway! Defects in the visual field show up as dark spots on the printout. I believe in using the use the most advanced visual field machine available, the top-of-the-line Humphrey by Zeiss. Visual fields are typically done once a year. Heidelberg Retina Tomography (HRT): About 40% of the optic nerve will be damaged before the first loss is detected on the visual field machine. We have known this since the 1960’s based on autopsy studies. Ophthalmologists have been looking for a way to reliably detect early glaucoma loss for many years and has recently developed the HRT to do just that. The HRT uses a laser to measure the thickness of the optic nerve around the optic disk. Repeated measurements over time will tell us if the thickness is staying the same, which is normal, or getting thinner, which is potentially an early sign of glaucoma. It is recommended that the HRT be done every six months for three or four visits in order to see if a downward trend is present. After this, I can reduce the visits to once a year in some patients but in those with a higher risk of glaucoma, staying on a six-month regimen is more appropriate. Drops: Drops are one of two initial treatment options and today, we have very effective drops that are easy to take. Compliance with taking the drops is directly related to how many times a day they need to be administered. The more drops you need to take every day, the less likely you are to take them. Fortunately, new drops have been developed that lower IOP significantly and have once-a-day doses. Multiple types of drops may be needed in order to get your IOP to a safe level. Laser treatment (SLT/ALT): This is an in-office laser treatment that opens up the drainage meshwork so that the aqueous can drain out better. It has been shown in a major clinical trial to be as effective as drops in the initial treatment of glaucoma. If it does not work, drops are as effective after SLT/ALT as before SLT/ALT, so we have little to lose in trying SLT/ALT first. The success of SLT/ALT seems to be related to how much pigment is in the drainage meshwork, the more pigment, the better SLT/ALT works. Overall, 70% of patients will respond to SLT/ALT by lowering the IOP. The effect of SLT/ALT lasts for an average of three to five years and slowly wears off. SLT/ALT does reduce the need for drops during those three to five years and, for many patients, makes non-compliance less of an issue. I have had some patients that presented IOP’s above 40 that had their IOP go down to 15 within a week after SLT/ALT. This is an exceptional response and is not typical, however. As you can tell, I am a fan of SLT/ALT! Cyclodestructive procedures during cataract surgery: I think that this is a good option for Patients with glaucoma and cataracts and should be discussed with your cataract surgeon prior to cataract surgery. Complications are less than with trabeculectomy surgery and it is easy to do during cataract surgery. In the future, better technology may expand its use beyond just during cataract surgery. Surgery (trabeculectomy/ Setons): In this country, trabeculectomy surgery is the option of last resort. Complications are high, compared to the above two options, and include a permanent worsening of your vision. Newer, smaller surgeries are being developed that promise to fall somewhere in between lasers and traditional surgeries in their risk/benefit profiles. This is described in the academic literature as a “rare” type of secondary open angle glaucoma and it has caused some controversy in the academic ophthalmology circles. The best theory, in my opinion, as to how it occurs is as follows. Due to a higher aqueous pressure in front of the iris than behind it, the iris bows backwards towards the lens. Our best guess as to why this pressure differential occurs is that blood pressure pulses from the retinal arterioles sets up pressure waves that get transmitted through the pupil, reflected off of the cornea and push the iris backwards. In any case, this backwards configuration, easily seen on gonioscopy, sets up the problem. Every time the iris dilates and constricts, pigment from the back of the iris is rubbed off by the “ligaments” (called zonules) that hold the lens in place. These pigment particles float free in the aqueous and are deposited on the back surface of the cornea where it forms pigmented lines known as Krukenberg’s spindles. The pigment also gets deposited in the drainage meshwork, plugging it up. If enough pigment gets rubbed off, transillumination defects occur in the iris which are seen as radial lines in the iris by your doctor. Most referrals for PDS to Ophthalmologists are due an excellent Optometrist noticing Krukenberg’s spindles or iris transillumination defects during a routine eye exam. Exercise causes our pupils to dilate and constrict a lot, which then releases a lot of the pigment, causing the IOP to go to very high levels for a short time. 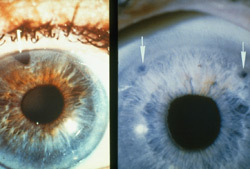 This very high IOP forces aqueous into the cornea, causing a cloudy cornea. This is one of the classic symptoms of PDS, cloudy vision after exercise. Treatment of PDS includes drops that constrict the pupil, causing a mild iris bombe and a lifting of the iris off of the zonules. These drops can cause mild headaches and are needed essentially for the rest of your life. I prefer another treatment. If some of the tests show early damage or if the IOP goes above 20, an LPI (see angle closure above) will provide a potentially permanent reduction in the amount of pigment released from the iris. The LPI provides a shunt to eliminate the pressure difference on either side of the iris and reduce if not eliminate the backwards bowing. An LPI is an easy to do office procedure that has few complications. SLT/ALT in PDS is a very good option to get elevated IOP down as well. SLT/ALT works very well in PDS due to the high amount of pigment in the drainage angle. I would offer the LPI first so as to reduce any further pigment from being released and then offer the SLT/ALT if the pressure stayed too high after the LPI. One more word about PDS. The academic literature is full of descriptions of PDS that I have not found to be reflective of my private practice. PDS is described as a rare entity that confers a 50% chance of developing glaucoma and an LPI is rarely mentioned as a treatment modality. I have had about 50 cases of PDS in my clinic alone in the last 5 years and I find that less than 10% of these patients develop damage of the optic nerve. (And, I see patients with PDS at all ages). I have checked many of my patients after exercise and I have not seen the high IOP spike that may occur after exercise. I also find that an LPI will significantly reduce the backwards bowing in the majority of patients and is a very low-risk, in-office procedure that I offer frequently. I don’t want you to get discouraged if you read other sources of information on PDS. Why the difference in my experience and the academic literature? Well, technology has changed. In office LPI’s were not available before 1990 and LPI's had to performed with surgery in an operating room. Also, academic centers tend to get the more severe cases referred to them from private practice and, since academic centers write most of the research on a subject, they can make a condition more dramatic than it really is. I think that this is true for PDS. Recently, the treatment of corneal ulcers was found to be very different at academic centers than in the private practice world due to some of these same reasons.